Two years ago, I published one of my most popular posts: I’m 35 and I Don’t Know If I Want a Baby. People still leave (awesome, in-depth) comments on it, so I’ve decided it’s time for a follow-up. Shortly after writing that post, my husband and I decided to go for it. We knew we didn’t want a big family (as in, two kids would be too many for us), but one child seemed doable. After trying unsuccessfully for over a year to get pregnant, we both went to doctors to get checked out. Test results uncovered a fertility issue we hadn’t known about. Receiving definitive test results was a relief. There is a diagnosed issue. I’d rather know about it than wonder every month why it hasn’t happened yet. There is no more ambiguity. A fertility specialist told us getting pregnant naturally isn’t impossible, but the odds are very low. The odds are so low, I asked my husband to stop saying “If we have a baby,” because if we decide not to pursue an alternative method I’ve accepted it will not happen. I questioned for many years whether I wanted a child or not, so I’m sure that helped me receive the news as readily as I did. I know it’s not the same for women who’ve known they wanted a child from a young age, or have pined for success for many years. If you were to ask me how I feel today, I’d say I’m a little bit sad, but I am mostly resigned. I’ve known about this for months now, so it is not fresh. It has sunk in and I’ve accepted it. I am disappointed but not devastated. Family and friends have told me this situation seems unfair. We would make stable and loving parents. That may be so, but infertility happens to potential good and bad parents alike. We are not special. Just because we would make good parents doesn’t mean we deserve the opportunity more than anyone else. I have moved on to thinking how my future will be different, now that I know my husband and I will likely remain a two-person family. We could choose to undergo infertility treatment, but we’ve been told the only procedure with any reasonable chance of working would be IVF. I know people who have been successful with IVF, and I know people who have gone through multiple rounds unsuccessfully. I’m not going to list my personal reasons here; rest assured this topic has been extensively researched and well thought out. My husband and I have had long conversations about it. I know what my options are and I choose to decline. Adoption has made many families very happy. I recognize it is an option for us, and I’ve done some research (domestic and foster care), but that’s as far as I’ve taken it. I have a good idea of what’s involved and it doesn’t seem appealing. While I don’t plan to change my mind about infertility treatment, I could possibly change my mind about adoption. It’s not something I want to pursue right now, but we may decide to revisit it down the road. If I was going to have a baby, I wanted it to be easy. You know what I mean: positive pregnancy test, expanding belly, morning sickness, maternity clothes, checkups, mood swings, purchasing a crib and stroller, healthy baby. That kind of easy. I realize pregnancy is not easy, but it seems a heck of a lot better than going through infertility treatment before you can even start with the whole pregnancy business. It’s also more appealing than all the red tape, stress, and potential despondency involved with adoption. 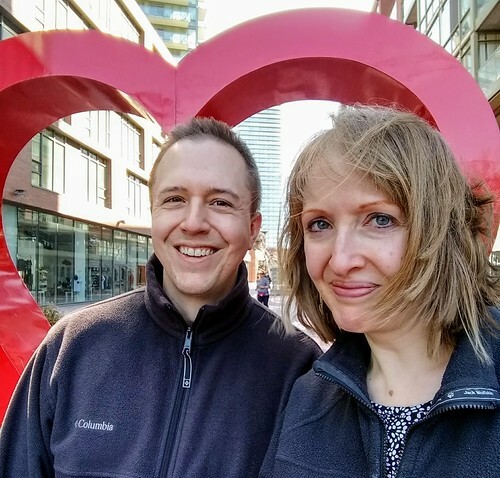 In the meantime, we live our lives, we get a lot of uninterrupted sleep, and we do things like take spontaneous weekend trips to Toronto (complete with wind-blown hair) just because we can. Selfish, Shallow, and Self-Absorbed: Sixteen Writers on the Decision Not to Have Kids, Meghan Daum. Excerpted essays from the book can be read here, here, and here. The Art of Waiting: On Fertility, Medicine, and Motherhood, Belle Boggs. You can read an excerpt from her book here. Hubby and I were in the exact same situation about 3 years ago. I never wanted kids and he was back and forth so we decided to see what happens. Turns out he’s infertile. We were sad for a second (I felt tremendous guilt for making him wait too long), but got over it and honestly – best thing that could’ve happened. I love our life together. We have a lot of pets, we travel, we save for retirement, we hang out with our nieces and give them back at the end of the day..couldn’t ask for a better situation. I’m sorry to hear things have not been easy for you. We are routinely grateful that our path has been relatively easy and smooth (tho know that even among friends who got pregnant easily, there have been other road bumps). I’m glad you are embracing life to the fullest still. Spontaneous weekend trips and full nights of sleep sound amazing! Gosh, you recognized pregnancy isn’t always smooth in your post. D’oh — apologies for not reading carefully enough the first time through. I’m also glad you’re able to be a fabulous aunt (and, I imagine, “aunt” to your friends’ kids). There are many ways to celebrate the joy of children without having them in your house. And yes, I do indeed enjoy being a real aunt to five nephews and an “aunt” to friends’ kids! Thank you, as always, for your kind words and support. I wish we could have had this conversation while walking around Yards Park, because I still remember that long walk we took years ago and kick myself that we didn’t make it happen more often. If I had a child, that would be amazing, but I’m also positive I can be just as happy on the childfree path (the thought of early retirement is pretty appealing). Love and hugs to you, too! Thank you for sharing this post. I still go back to your first post from 2 years ago from time to time as my husband and I continue to question if we want to have a baby or not. I appreciate you sharing these books – I think he and I should look into them. Reading these words make all the effort in writing these posts worth it. Thank you for sharing! I’m glad to know my experience has helped you. I was actually just thinking about you and this post the other day. Sending a big hug your way. Really admire your honesty here. Know dealing with finding out something like this can’t be easy but you have such a great perspective here for all of the options and why they are or aren’t for you — which ones you don’t want to rush. In the meantime, know you and Paul will continue to be the great pair you’ve always been and take advantage of all of the great opportunities that come along with that. Thank you so much, Lara! It means a lot to me that you would say this. I figured if I was going to write about it, there was no need to beat around the bush. I also decided to address the infertility treatment / adoption questions in advance, because if I hadn’t said anything people would have been curious if I was contemplating one or the other. Better to go ahead and get it out in the open. Hugs to you! I was given the same news about 5 years before I was to get pregnant with my first daughter. Zandria knows very well how much I wanted to have kids and being told I would likely never have them was heart breaking for me. However my dreams came true in 2006 when I gave birth to Lily and again in 2009 when I had Kylie. The body does what it does and it finds a way of doing what’s right when it’s right. I had even taken hormone treatments when I was diagnosed and nothing changed, until everything changed. I love reading your posts. You are so open and honest, and I respect that so much. You are the sweetest. Thank you! Who would have thought I’d still be writing my thoughts on the web, almost 15 years after I started? I often hesitate over writing the honest posts but I’m always glad I put them out there once it’s done. I get such amazing feedback. Oh Zan. This hits so very close to home. I never wanted kids, either, except possible adoption, but I know my husband and I would make great parents. Specifically, he would be a wonderful father and it would make him so happy. I toyed with the idea and then learned that pregnancy could be detrimental to my health- as well as the health of the baby’s. It was part relief, part sadness, part guilt… I still grapple with this. But I really like my life as is. I like being selfish. I don’t feel a ticking clock in my ovaries. It’s a lot of conflicting emotions, and you articulated this better than I could. Relief because, well, babies are a lot of work! And I’ve read all the studies that say children make you happy, but it can negatively affect your relationship with your spouse. Sadness because having a sweet, cuddly baby to spoil and nurture seems like an awesome opportunity (and my husband would make an amazing father!). Guilt because sometimes I think I should try harder to make it happen, but I relate to your “I like being selfish” because I really don’t like being guilted into something I’m really not sure is what I want to do. Oh, Zan! This post brought tears to my eyes. You’re right that you and Paul would make wonderful parents, but that infertility doesn’t take that into account when it strikes. I know it has been a journey but it sounds like you’re in a good place, and I am happy for you. I am in a good place! Thank you for pointing that out. There are many things I’m looking forward to, and (as nice as it would have been) I don’t need a wee one around to make me feel fulfilled. I think if I couldn’t have my kids, I would’ve felt the same way as you. To me, pregnancy — and everything that goes with it — should just ‘flow’ naturally, and IVF would just feel like too much effort and interference. I’m disappointed on your behalf that you and Paul won’t be able to expand your family. You are such a strong, level-headed, compassionate woman, and you would’ve made an amazing mom. I know I’ve learned a lot from you myself. But this alternate path is a different, no-less fulfilling, and personally-enriching adventure. I’m super excited for you. And I can’t wait to read all about it here. Of course I remember you! I love when old blog friends leave a comment out of the blue. Ma’am, you are a wonderful woman. I wish you a happy life. I’m touched. And speechless. Thank you so much for saying that. I have read your previous post to this several times over and every time it’s like I’m looking in the mirror. I’m 35 and my husband and I just don’t know if we want a baby. We’re both undecided. We also purchased our first home a year ago and don’t have any outstanding debt. We’re stable. But yet, we hesitate. My husband is 9 years older than me and that adds to the hesitation. My brother and his wife recently got pregnant through IVF and they are so excited. I’m happy for them and envy them in a way. Not because they’re going to have a baby but because they are so happy and at peace with their decision. Blessings to you and thank you for writing this. I have often thought of you and wondered how things turned out. This is incredibly sweet. It’s humbling to know these posts meant so much to you. I completely relate when you said you envy your brother and sister-in-law’s decisiveness. I’ve felt that way many times over the years (if only I had a calling for something to do as a career, for example…). My indecision where a baby is concerned has led me to make no moves at all, but the more time passes the more I find myself okay with it. I am so glad to have found this post and your previous one about deciding on parenthood. I relate so much to everything you have written. I am currently in my 30’s and feeling pretty settled in life – I’m in a happy marriage with a house and a good job, we are fairly financially stable and I feel we could be good parents – but I still cannot decide whether I actually want to be a mum or not. Naively perhaps I have always thought I would grow up and know what I wanted, but after several years, here I am still sitting on the fence! My husband is equally ambivalent and undecided about whether to have children. Yet society puts so much pressure on us to make a decision (and nearly always in favour of having children). It was so refreshing to hear from someone who feels like I do. I constantly weigh up both options and still I can’t decide. I am sorry to hear about your problems with fertility, but also encouraged to hear your positive outlook on it. Infertility or “leaving it too late” are issues I worry about but still not strongly enough to justify trying to a child yet. I only hope that if I do find myself in a similar position I would be able to rationalise it and cope as amazingly well as you have done. It is becoming more common for people to choose not to have children, but it’s not often people openly talk about it. Thank you so much for sharing your story. I’ve read both this and your previous article and appreciate reading how you feel about children and life. I had my only at 22, divorced, and then spent the next 18 years raising her alone. Started off on welfare and after a fierce battle ended up with the 6 figure salary. It wasn’t much fun though as I had to spend most of my time working. She’s off to college now and I don’t expect to hear from her for much else other than perhaps money. I will do my best to stay in her life but she’s very independent. I was also one of three children and the only one that really keeps much contact with my aging parents. I guess what I’m trying to say, children are only temporary – something that took me a good 15 years to realize. Newly a relatively young empty nester I’ve been staying hours a night thinking ‘Well, you could try for another, maybe give her a sibling… 18 years later”. It seems absurd during waking hours but at 2 a.m. it seems like the only solution. I know what really needs to happen is I need to find happiness and contentment on my own. Thank you for both of your posts. It is reassuring to see someone else thinking the same way. I’m 35 and still undecided. Last year I had unexpected miscarriage (did not plan the pregnancy, hadn’t even decided yet what to do about it when it happened) – and I remember myself thinking whether I should be sad or relieved. And felt myself guilty because I was leaning more towards relieved. And now the question is on the table again. My husband is also undecided. He sometimes says he wants children but also says he does not know if he will be able to rearrange his life enough – which means he hasn’t actually decided. But there’s a little annoying voice in the back of my head saying the clock is ticking and we should make up our minds really soon. We both have a job we like, we like travelling and spending time together. I love our independence. With every year that passes I see my friends and colleagues having children. I am happy for them. But I am also surprised that I do not see any happy parents. I keep seeing frustrated, tired and sometimes angry people who have trouble multitasking. Juggling between home-work-childcare-social life and being constantly stressed. And I keep thinking – why? I remember my own childhood in a big family. Although I love my parents and get along with them, I remember them being stressed and tired and overwhelmed. Rarely happy and rarely having time for themselves. And already then I kept thinking – why? People say that we would make good parents but what’s in it for us? When we are finally independent, free of most debts, happy with where we are – why should we want to take on an 18-years-lasting responsibility, sleepless nights, toll on my health, terrible teenage years….and when they are finally sort of normal, they leave. For the experience of it? Again – I do not see what’s in it for me. Having experienced many things during my 35 years, I do know how sleepless nights look like – no thank you. Or what it means to be physically unable to do the things you like (like pregnancy) – no thank you. Or what it means to go through hell to lose weight (imagine all the baby-weight) – no thank you. Or to multitask, be stressed and being pushed to do the work of 3-4 people all alone – no thank you. Or no-one being grateful for your input but demanding more and more and more – no thank you. Instead we can enjoy our time together, travel, take the best out of the spontaneus ideas, prepare for retirement (as we can save up more if we don’t have huge costs on children). And yet this annoying voice keeps saying – you have a decision to make. Apparently there is still some doubt that maybe there is some side of it that I can’t see…. You are so brave. You are so amazing. I am a blogger only by having a blogger not by actually bleeding dark blood onto the platform. Every time I read your words, not only do I weep (joy, sadness, admiration), I also often deeply envy. No, I need to encourage you to write a book.